As we deal with this season’s biggest snowfall so far, you might enjoy the opportunity to warm up with a bowl of chili this weekend. Two separate chili cook-offs are occurring this weekend in Cincinnati’s urban core. 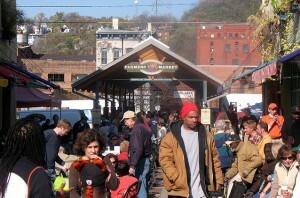 On Sunday, January 23, Findlay Market will be hosting their seventh annual Chili Cook-off. Everyone is invited to stop by between 1:00 and 3:00 p.m. to taste all of the entries. In addition to free chili, visitors will enjoy live music and a presentation entitled “How Hot Are You?” from Findlay Market vendor Colonel De Gourmet Herbs & Spices. Christian Moerlein beer will also be for sale in the OTR Biergarten. Cash prizes will be awarded to the three best chilis, as determined by the firefighters of Cincinnati Fire Department Engine Company 5 in Over-the-Rhine. On the same day, Park+Vine will be hosting their own Vegan Chili Cook-off. From 2:00 to 4:00 p.m., up to 20 chilis will be available for tasting at Park+Vine’s store at 1202 Main Street in Over-the-Rhine. There is a cost of $15 to attend, and proceeds will benefit the the Cincinnati Cooks! program from the FreeStore Food Bank. Everyone in attendance will receive a ballot to vote for the best chili in each of three categories.